Fast food chain Taco Bell has been around for years and you won't recognize it now at first glance! Taco Bell was founded by Glen Bell in the '60s, who introduced crunchy tacos in the US. It became the go-to place for quick Tex Mex fix in the Philippines since it opened its first store in 2004. Before heading to the theaters during the last MMFF season, we dropped by for a quick snack. I remember it was a little crowded and the walls covered with yellow, purple and big photos of their food. We didn't stay that long. Nowadays eating out is viewed as an experience in itself, no longer just simply to fuel our bodies. When we decide where to eat, it's no longer just about the cuisine. An establishment's ambiance, choice of music, etc. is as important. Taco Bell understands the ever evolving needs and wants of its consumers. Along with the company's new persona and slogan, "live mas!" (mas is Spanish for 'more'), their flagship store recently reopened with a whole new look! Expect a industrial rustic mood plus more open spaces and better lighting. Currently on its soft opening, the grand launch will happen on May 15, 2015. 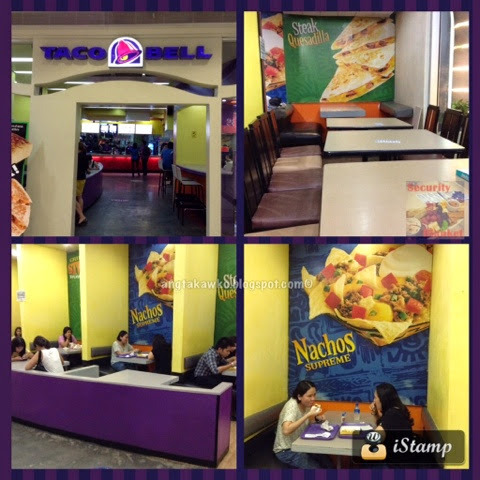 Other Taco Bell branches can be found at Food Express, Gateway Mall and Trinoma. For more news and promos, visit them on Facebook, Twitter and Instagram accounts.